Preheat the oven to about 200 degrees/180 fan/gas mark 6. While the oven heats up, pop the bread in for about 10 minutes to dry out with a pinch of salt. Of course, if you’d rather buy croutons I won’t tell. With a small, sharp knife score the fat of the duck breasts. Take care not to hit the meat or it won’t cook evenly. season lightly with salt and pepper. Heat up a frying pan or skillet till really rather hot. Add the butter and some oil to stop the former from burning, then a garlic clove, flattened with the heel of your hand or a knife and the rosemary. When all is frothing place the duck breasts in fat side down. Cook for 7-8 minutes until the fat is browned and crisp on top. Turn over and continue to cook for a further 2-3 minutes. I fried the croutons in the remaining duck fat from the pan, but you can use oil if that makes your arteries clench up. When golden remove from the pan and pop them on some kitchen towel. Season lightly. Drain off the remaining fat and wipe the pan, then return to the heat. Toast the walnuts, remove then fry the little strips of pancetta till golden and crispy. Remove to the kitchen towel, deglaze the pan with a little white wine, add a little more butter and the sliced ceps. Add some finely chopped parsley if you like (I like). Take the duck out of the oven and let it sit for a minute. Toss the rocket, nuts, bacon and croutons and split between deep plates (or in my case shallow bowls). Scatter over the ceps. 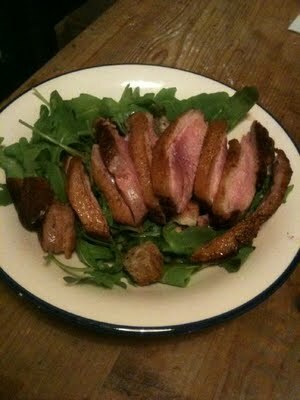 Slice the duck breasts fairly thinly and serve on top of the salad, drizzling over any juices. Sit down with the person you’re cooking for, have a glass of wine and proudly point out how little washing up you’ve left them.